Martin Colloms reviews the recently introduced Rupert Neve RNHP headphone amplifier and this is just the start of further headphone related content including two headphone amplifiers/preamplifiers from Californian maker Schiit using triodes, the Mjolnir II and the Vali II the latter just £150. Chris Frankland gets his teeth into an unusual floorstanding loudspeaker from Neat, the Iota Alpha. Andrew Everard assesses the unusually versatile and long awaited high end Marantz digital audio player, the Marantz SA-10, the one ostensibly lacking any output filter. 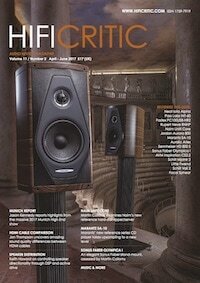 ​Adding to the audiophile content we have the Olympica One from Sonus Faber, an elegant near Guarneri performing stand-mount compact of exquisite finish and fine stereo imaging, reviewed in depth by Martin Colloms, while Stan Curtis’ Safari series looks at issues with hearing for this edition, relating his own recent experiences. ​Jason Kennedy has enough space to try and give us a taste of the amazing, near overwhelming 2017 High End Munich show while Rafael Todes tries out one from the up and coming Auralic brand of streamers, the promising Aries. Hot tube die hard Kevin Fiske tries out the surprising solid state Pass Labs INT-60 integrated amplifier. 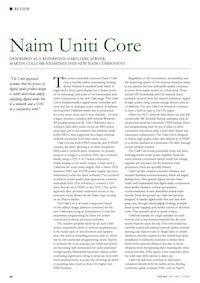 Colloms tackles the long awaited in-depth assessment of the Naim Uniti Core server, a component of the all new Uniti 2016-2017 range which includes amplifiers and streamer DACs. 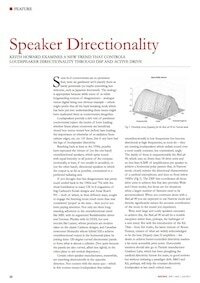 Keith Howard researches in depth a subject close to his heart, how loudspeakers radiate sound energy and how to control it for best sound in the listening room. 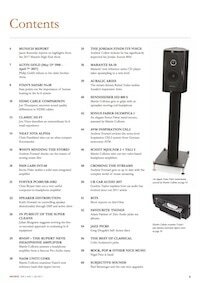 There is an update by a Jordan fan on how to adapt the Aurora 800 loudspeakers previously reviewed by Paul Messenger, while the Chord Cable Company’s Sarum-T cables are assessed by Paul. ​Industry stalwart Jon Vizor recalls a memorable experience with the merits of mono reproduction when he was a retailer while Andrew Everard digs still deeper into the subject of digital audio control and storage, NAS devices and usage, also separately covering streaming source developments. ​Additional features include hard look the sound quality implications of the HDMI cable interface and the effect of cable quality and run length, by expert Jon Thomson, while we have an interesting update on ICE , in car entertainment, from renowned expert Gordon Taylor. ​Not to be ignored our resident philosopher Julian Musgrave philosophises on the ‘Pursuit of the Super Cleans’ after discussing the ‘Gadarene Swine Fallacy’. He listens, and then suggests a new way of evaluating audio equipment. ​Paul Messenger also covers the Little Fwend, that automatic end of side Norwegian tone arm lifter mentioned in the last issue. 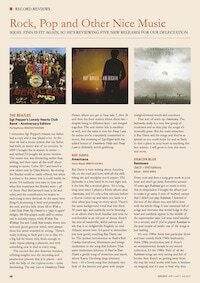 ​We have a guest contributor Adam Fairless, introducing his shortlist of favourite recordings. 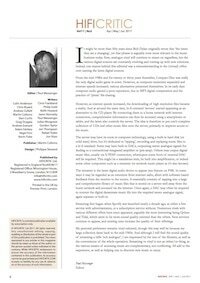 Also for music coverage content we have many Rock, Jazz and Classical reviews, while the issue finally closes with Paul Messenger’s column Subjective Sounds with further developments in cast iron loudspeaker technology.